So says a new report, which estimates that the richest 1% will have as much wealth as the other 99% combined by next year. The richest 1% have seen their share of global wealth increase from 44% in 2009 to 48% in 2014," Oxfam says in a report Monday, JAN 19, 2015. At that rate, the wealthiest will own more than 50% by next year, according to the report. The 80 richest people on the planet have the same wealth as the poorest 3.5 billion people, the report says. the "global elite" members had an average wealth of $2.7 million each last year. While 1% of the population owns 48% of the world's wealth, a majority of the remainder follows the same trend. 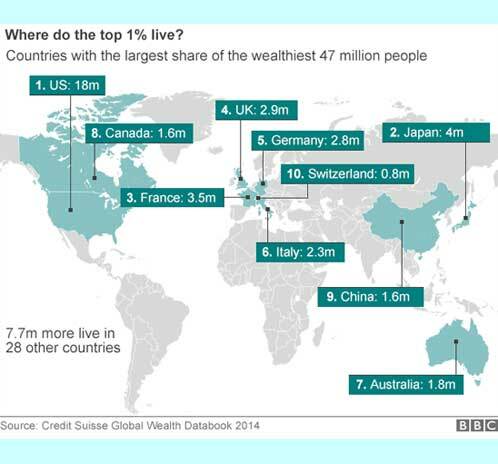 Of the remaining 52% of global wealth, 46% is owned by the rest of the richest fifth of the world's population. The remainder of the population only possesses 5.5% of global wealth. Their wealth last year? An average $3,851 per adult. The role of the best 1% people in social matters troubles me for years. How much do we depend on them? Does it justify their privileges? On the subject of the "richest 1%" I’ve commented recently . So, when I spotted the BBC graphic (above, right), I’ve thought I would easily update that story. It didn’t turn out this way. For the start, I was stun by the immense number of the WW1%, millions of them: 44 million on the above graphic, 47 million adults according to Credit Suisse - everyone with wealth of US$798,000 or more. Obviously, I fell for the phrase which conjures up images of billionaires living on private islands while accumulation of wealth is a global process in our time: the wealthiest 1% have seen their share of global wealth increase from 44% in 2009 to 48% in 2014. Those numbers indicate that WW1% are counted relatively to wealthy people only, i.e. upper percentile of the wealth scale. The bank Credit Suisse estimated total global household wealth in 2014 at 263 trillion US$. young people in Western countries may fall into the bottom 50% of wealth - either because they still have student debt to pay off, or because they know how to live well, and spend all their income. the Credit Suisse's report doesn't take into account how much it costs to buy goods in each country. The WW1% include many people in rich countries who may not regard themselves as particularly wealthy, but who simply own their house outright or have paid off a significant chunk off their mortgage. Germany has the biggest economy in Europe. The reason it has fewer wealthy people - by Credit Suisse's measure - is that it has lower levels of home ownership. The country with the largest proportion of its population in the 1% per capita is Switzerland. One in 10 Swiss residents - 800,000 out of 8m - have assets worth more than $798,000. On the other hand, the Swiss WW1% are "cheapest" to produce (column F). If entry into the 1% does not guarantee a jet-set lifestyle, this is even truer when it comes to the cut-off point for the wealthiest 10% - for this you only need US$ 77,000 of assets. And the figure required to be in the top half of the world's wealthiest is just US$ 3,650. What a poor world we live in .